While I agree that public comment should not be stifled, I also can see Oliver’s point as several commenter’s show up to make speeches and see themselves recorded on television by CVTV. 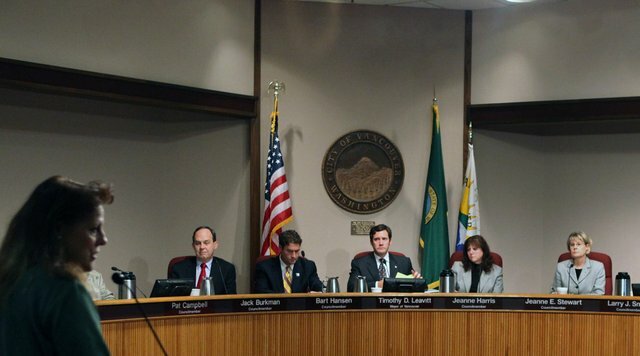 It was just a few years ago, though that the editorial staff of the Lazy C seemed to hold a different view in regards to public comment before the Vancouver City Council pertaining to the now comatose Columbia River Crossing light rail project that the Lazy C strongly supported. We were treated to specious claims of people “being stared down” and creating an “unwelcoming environment for newcomers,” previously covered by this blog here. This was occurring just months after the famous “Gavel Down” outburst between a citizen and former council member. Mayor Leavitt did not fully succeed in stifling CRC critics comments then, but did manage to “modify” their ability to comment somewhat with a few changes to public commenting. Of numerous articles published pertaining to Leavitt’s efforts, I saw none chastising him for “stifling” citizen comment. We were treated to an In Our View editorial on March 23, 2011 informing us of the “Reasonable Rules” instituted. I find no efforts by the Lazy C to label Leavitt’s efforts back then as “stifling,” but if you will recall, when Senator Don Benton (R. 17) was hired as director of the County Department of the Environment, it was the Lazy C’s editor, Lou Brancaccio leading the charge calling upon citizens to attend County Council meetings and “speak out” against the hire. We saw two successive and hours long meetings with numerous vitriolic citizen comments directed towards the hire. An effort to “modify” citizen comments then by merely moving them to the end of the meeting was not well received by the Lazy C or listed as “reasonable” as when it was directed towards CRC critics. Lest you believe Clark County is unique in having to deal with citizens attempting to hog the citizen comment, this past January saw Spokane City Council limits participation in weekly public forums. What I do not see there is the Spokane media picking and choosing when to support or oppose citizen commenting based upon their editorial boards agenda. Isn’t it past time for citizens who are fed up with the “C’s” poor journalistic practices to cancel their subscriptions and tell their advertisers that we won’t support them if they continue to advertise in that sad excuse for a ‘newspaper’ ????? Think what a step forward that would be for Vancouver and Clark County! The left constantly “supports” free speech — so long as it agrees with their point of view. They will go to remarkable extremes to silence those who criticize them. I have long advocated no subscribing to magazines or newspapers that do not provide a reasonably fair and balanced reporting policy. (e.g. a magazine focused on history and science, in an article otherwise having nothing to do with politics, included nasty comments about George W. Bush in an article about some fish in the Amazon or something like that. Bush (or the U.S. government) had not been involved with anything mentioned in the article, but the journalist felt the need to toss in egregious negative comments toward the end of the article. Clearly, the editors should have ‘flagged’ the paragraph and deleted it (it was completely irrelevant to the story.) Yet there it was. No more Smithsonian for me. Of course, after looking over a copy of the Columbian, one that had conveniently been abandoned at the DMV where I was getting a WA license after moving here, I could see that the Columbian was worthless, as it was filled with biased reporting. I will not and do not subscribe to that paper. I do receive their “north county times” (a weekly shopper), that I just toss into the recycle can (unread) when it arrives. I do not advocate boycotting merchants who advertise in the Columbian (for one thing, I’d have to buy the Columbian to see who’s advertising). But, if it comes up, I tell merchants that ads in the Columbian are a waste of their money as I don’t and won’t ever read them. If they wish to reach me, they’ll have to try other means.